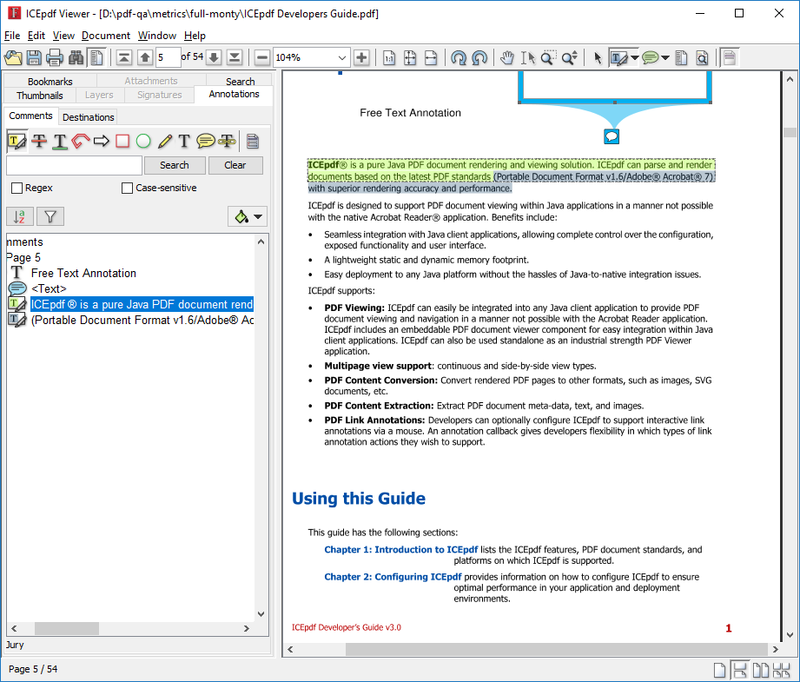 The Viewer RI is able to display and add / edit / remove annotations from a PDF document. To view, edit, or delete an existing annotation, first use the Annotation Selection Tool to select an existing annotation. The Annotation pane of the utility panel will be made visible and the selected annotation will be highlight in the annotation tree. It can be moved via dragging it to a new location on the page with the mouse. Context menu allows for quick access to common annotation tasks. It can be deleted/removed by pressing the }Delete }key, or the Ctrl-D/ Cmd-Dkey (OS X). The annotation quick tool bar is shown on the main ICEpdf toolbar by default. It contains commonly used annotation tools. The annotation tool bar is contained within the utility pane "Annotations" and is shown automatically when an annotation is selected. Annotation Editing Mode; shows hidden link annotations and destinations. To create a new annotation, use the Annotation Tool of choice. With the tool selected, the mouse can be used to draw the Annotation in the desired page location. Once the annotation is selected, a context menu can be used to show the annotations properties. Annotation Comments Utility Pane Tab. The annotation comments utility pane allows a user to see all markup annotations of a document. The view can be search, filter and sorted using the convenient drop down controls and input fields. Annotation Destinations Utility Pane Tab. The Destinations tab of the annotation utility tab shows all destinations defined in the document. The tree can be manipulated using contenxt menu commands when right clicking on any node. Order is automatically defined via the name tree data structure. New destinations can be added using the annotation selection tool and right clicking on a page view. Color selection for highlight and text annotations can be accelerated by using the drop down menu. The menu allows a user to set a or define a color as they see fit. The color will be used for subsequent annotation type uses. Similarly any selected node in the annotations tree view can quickly have it's color changed by the paint bucket drop down menu button. The quick color drop down menu also allows for the definition of named colors. Named colors can be used to infer meaning from a particular color that will be used repeatedly. The "preferences" button or menu item allows a uses to define any number of named colors. Once created the annotation drop down menu will show the available named colors. The annotation preview windows uses named colors to summaries a documents annotations.